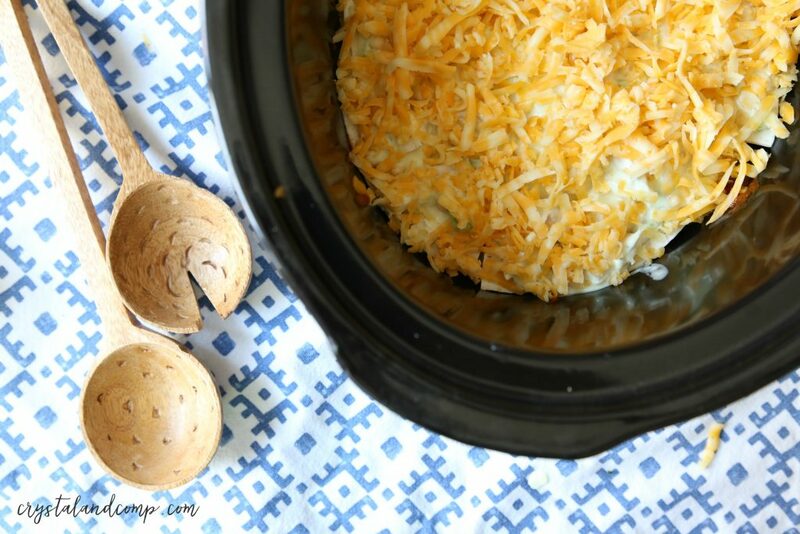 Do you know how easy it is to make a casserole in the slow cooker? Remember, anything the can be cooked in the oven or on the stovetop can be recreated in the slow cooker simply by adjusting cook time and liquids. 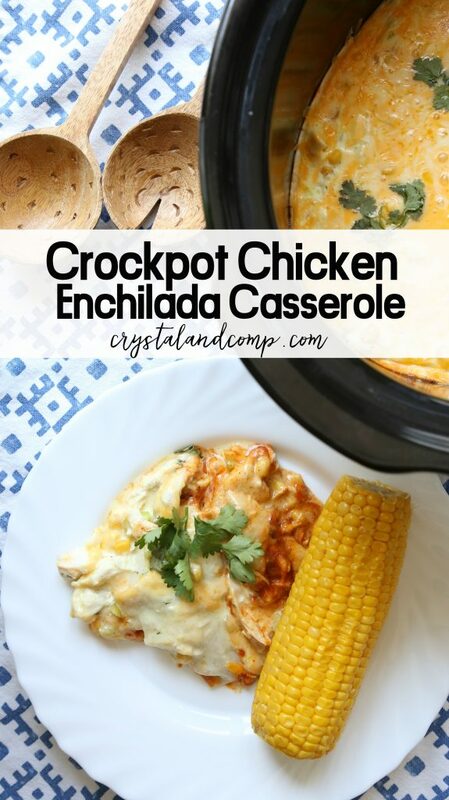 Let me show you how delicious this crockpot chicken enchilada casserole is and how quickly it comes together. Make sure you check out all of my easy recipes while you’re here! They are perfect for busy moms and families!! Chop up your pre-cooked chicken. Combine the soup, sour cream and chilies in a medium bowl. Mix well. Add the chicken and corn to the bowl and stir. Grab your crock insert. This 6 qt oval programmable slow cooker (aff) is my favorite! Pour half a can of enchilada sauce in the bottom of the crockpot. 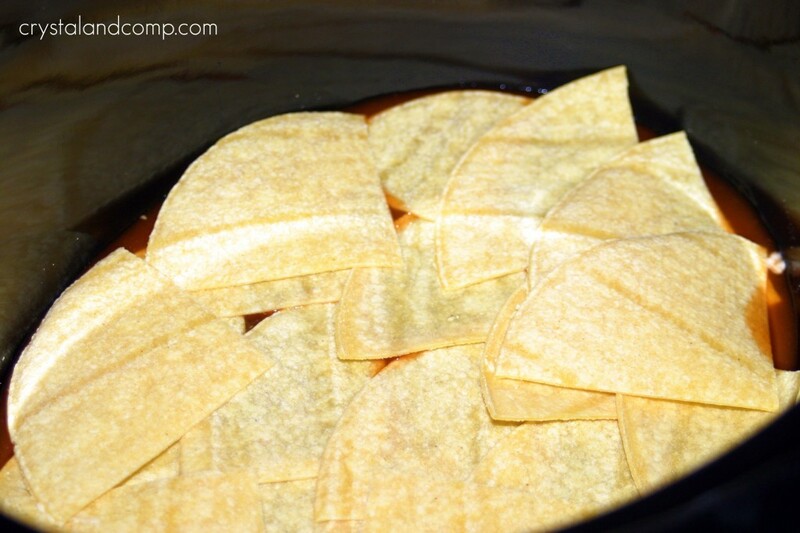 Layer half of the tortilla shells over the sauce. You can use corn or flour, you choose. 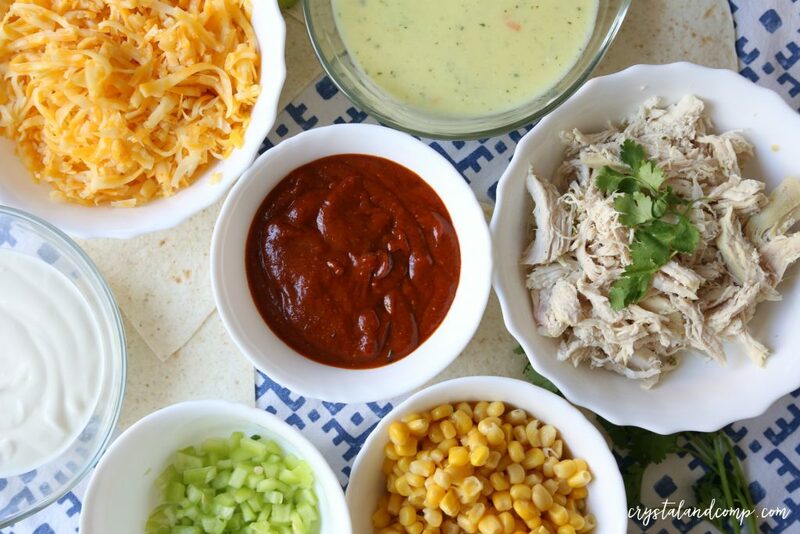 Spread half of the chicken and soup combination over the tortillas. Then repeat the steps using the remaining ingredients, starting with another layer of the enchilada sauce. Once you’ve completed two layers, pop the lid on it and cook on low for 4-5 hours or on high for about 3 hours. This is going to cook pretty fast because everything is really already cooked. What I love about the programmable slow cooker is once the cook time is up, it moves to warm and waits until you and your family are ready to eat. Here is a quick video that shows how easily this recipe comes together. Combine the soup, sour cream and chilies. Mix well. Add the chicken and corn and stir. Layer half of the tortilla shells over the sauce. Once you've completed two layers, pop the lid on it and cook on low for 4-6 hours or on high for about 3 hours. It was very tasty. Give it a try. How is that new baby, Priscilla? This looks delicious. I’m always looking for recipes like this that are quick, healthy, and filling. Thanks so much for sharing! 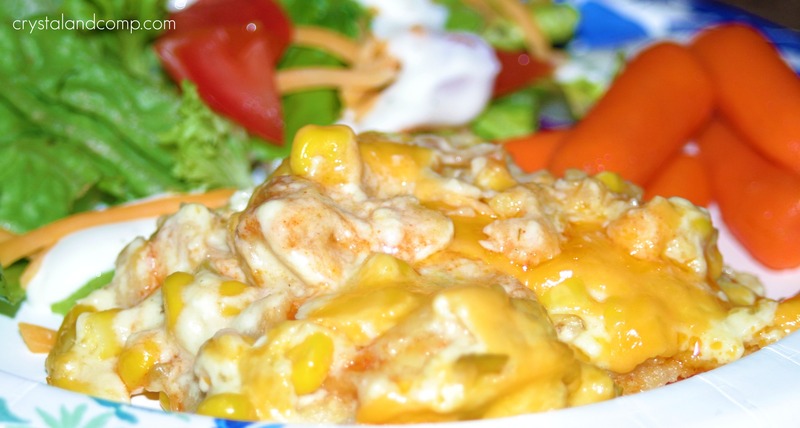 What a great recipe and I just love that it is in the Crockpot. We will be having this delicious recipe very soon. Hope you are having a great week end and thanks so much for sharing with Full Plate Thursday. It won’t let me print this unless I have a pintrest account? That’s not really fair, I wanted to try it, but I’m not going to join a website just to do so…. Hum. That is really interesting. The recipe print function is unassociated with Pinterest. Are you using the print button that is in the light purple box after all of the recipe pictures? The print button is next to the five gold stars. If that does not work another option would be to go to the very end of the post and there is a row of icons right above the comment section. You will find an icon of a printer, an envelope, a star, Facebook like icon, etc. If you hit that printer icon it will let you print from there as well. What print button did you use the is forcing you to join Pinterest? I clicked the print btton in the purple box… Then it opened in a new window with a new box at the top… But when I saw your reply, I came back to look again, and when I clicked the button in the purple box it worked… Maybe it was just a glitch?? Also, I’m sorry I seemed so rude in my post. I’m dealing with the husband being away and a 20 month old with Chicken pox… And an A/C that’s on the fritz… Definitely been a case of the Monday’s around here! No worries at all. I was concerned there was a glitch somewhere and wanted to know exactaly how the process worked from your perspective. Glad it worked the second time around. I added a Pinterest button yesterday at the top of each posting area, and it has not been functioning right. I was afraid it was effecting the print feature somehow and that really worried me. Glad it printed. Hope you enjoy the meal it is really yummy. This sounds delicious! I’m always on the hunt for crock pot recipes. BusyWorkingMama recently posted..Ice Cream Cone Cup Cakes #Recipe is a Fun Kids Project! Wow never thought to do enchiladas in the crock pot! what a great idea for potlucks! Yum! I can’t believe that I have all the ingredients on hand! This may become supper tomorrow night! Thanks! Oh. My. Goodness. I want to make this right now!!! Too bad it’s nearly 11pm… 🙂 Guess I should wait until tomorrow. Thanks for such a yummy-sounding recipe! I’m here from WFMW–happy Wednesday! I printed this one out, looks fantastic! Stop over for a visit sometime! This looks so yummy! I love my crock pot! Thank you for sharing this! This looks like a great weeknight meal! I shared this recipe on my Must Try Tuesday post this week. Looks really good and easy. I like the method because it could be varied in all kinds of ways. What size crockpot did you do this in? Small or large? I used a 6 qt oval crockpot. This sounds really good! I’m pinning for later! I just put this together but I didn’t have any chilis or sour cream. I softened 8 oz of cream cheese and added some finely diced onion and a jar of pimentos. Also added some more seasoning (cumin, minced garlic, S and P) YUM!! Can’t wait to have it!!! Teresa- that sounds yummy. Let me know how it turns out. I love crockpot recipes and this looks delicious! that looks so good! I cannot wait to try it! Quick question – what size can of “cream of chicken soup” did you use? Thanks! Sounds SO yummy, can’t wait to try it! I make something VERY similar to this in the oven, so I’m rating your recipe before trying it. 🙂 I never thought of trying it in the crock pot! Your recipe should work equally well with cooked/drained ground beef or turkey or a combo of both ground meats. Junassicpark- your variations sound delicious! I made this last night and it was amazing!! We aren’t fans of corn tortillas so I used 5 flour ones instead and it worked great! Could be my crock pot but 4 hrs on low was plenty of cook time and lead to burnt edges. Will probably cook for 3 or 3.5 next time. Thanks for the great recipe!! A coworker made this and brought it in for a potluck recently. She used black beans instead of corn and it was so good that I couldn’t stop thinking about it so it’s in the crock pot now! I used black beans AND corn. I also used some chopped fresh cilantro mixed in the soup and mozzarella mixed with cheddar. I can’t wait!! Wow, that is awesome. Makes me so happy. So glad you enjoyed it and your modifications sound awesome. Have this cooking right now! 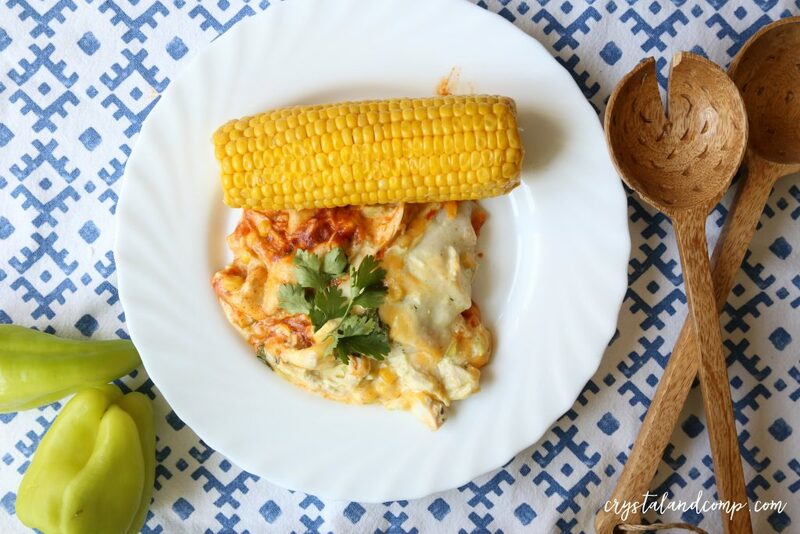 It’s what I would call ‘comfort’ TexMex and SUPER easy!